In 2001 W.P. 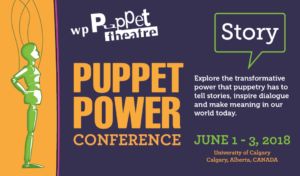 Puppet Theatre Society, wanting to expand our performance and education practice, took up this very challenge and, as a result, launched PUPPET POWER. He made a wooden spoon puppet representing his mother, when all the other kids made puppets of themselves. Joseph is one of a busy family of six children. He wishes he could have more of his Mum’s attention. She stepped out of her fear to grow as an artist and as a person. Who guided 60 grade two students to make over 100 puppets, all with their own individual personalities, and produce movies such as “Nicolas Makes Fun of John” and “No Standing on Chairs in the Lunchroom”. Produced biennially, the conference includes international speakers as well as many local, national, emerging and professional presenters. Spanning two to three days the event draws around one hundred, local and national attendees, from three demographics: professionals i.e. 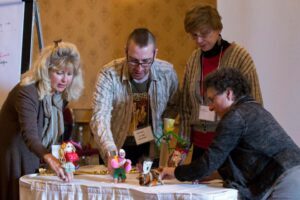 : teachers, social workers, therapists, health care; artists looking to extend their practice by making connections; and thought leaders, idea generators and students. 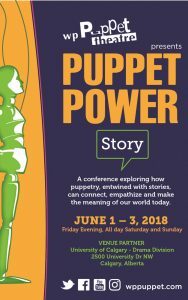 The conference features a friendly blend of keynotes, hands on workshops, peer mentoring, exhibits, and panels, as well as professional puppet shows to model best practices in the art of puppetry. mentored over 150 attendees to think deeply about ‘story’, and experience the transformative power of all things, living and non-living, to tell stories – including stories and songs that have been told on this land for thousands of years by our first peoples. 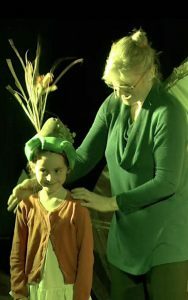 2016: Connecting Generations: Two keynotes: Karrie Marshall of Creativity in Care (Scotland) and Eric Bass of Sandglass Theater (USA), move the audience to tears as they speak of their work with dementia and Alzheimer participants. 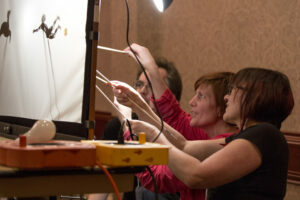 Sharon Bayly (Vancouver), Marla Limousin (Courtney) and Mudfoot Theatre (Calgary) were also wonderful presenters. 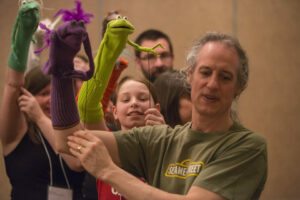 2013: The Fearless Face of Puppetry had Martin Robinson inspire us as our keynote and master class presenter, and Trish Leeper talked about the impactful “Tale of Teeka”. Relive the weekend’s events in our Photo Gallery. 2007: Puppets as Agents of Social Change featured Gary Friedman speaking on Puppets in Apartheid and a giant puppet parade in which the puppets themselves presented a Manifesto based on the UN Charter of Rights and Freedoms. 2005: Puppets Promote Literacy had Judith O’Hare present The Literacy Connection as keynote. 2003: Embracing Multiculturalism featured an exhibit of Kathy Foley’s puppets, a performance by Puppetmongers and a workshop by Chinese Theatre Works. 2002: Puppets as a Therapeutic Medium saw Mickey Aronoff presents “A Soul in the Palm of your Hand” as the keynote. 2001: Puppet Power Inaugural: Matthew Bernier spoke and lead wonderful workshops on puppets used in therapeutic interventions.